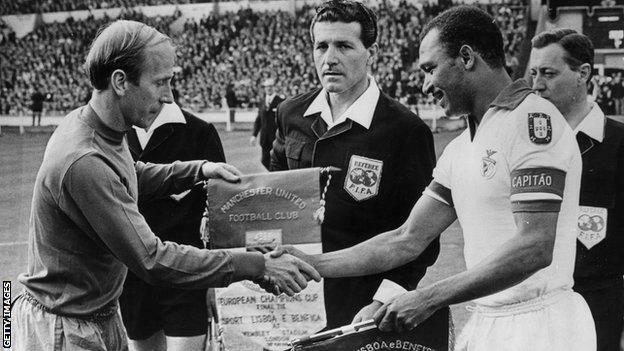 Manchester United captain Bobby Charlton exchanges pennants with the Benfica captain, Mario ColunaYoung Manchester United fans found themselves with a dilemma on 29 May, 1968 - skip school to watch their team become England's first European champions, knowing only too well the repercussions that awaited: the teacher's cane.These were the days before corporal punishment was outlawed in British schools, and the threat was real. Yet according to United fan Pete Molyneux, it was no choice at all on that night 50 years ago. He was prepared to risk sore body parts and more to be at the European Cup final against Benfica. After three semi-final failures, the clamour to go to the big game, hosted at the old Wembley Stadium, was enormous for United supporters. And Molyneux, 13 at the time, was fortunate to be in the near-100,000 crowd with his dad Bill. "The Head Teachers Association said children going would be treated as truancy if you didn't bring your ticket into school as proof and get formal permission to go," said Molyneux. "There were lads at school who went to the game without doing that and got the cane the next day. It sounds draconian but things were different back then. "It started with a story about some schools turning a blind eye to absentees on the day compared with schools that were taking a hard-line stance and threatening to treat the matter as truancy." Pete Molyneux has retained his ticket and match programme from the 1968 European Cup finalMolyneux, who began following United in 1963, was initially told that going to the match was forbidden. "The whole nation had a view," he said. "Bombardiers were writing letters to the Times saying it was an example of the country going downhill. "In my hierarchy of needs watching United was more important than sitting through a maths or history lesson." United's triumph was of personal significance to the club's manager Sir Matt Busby. Their 4-1 extra-time victory over Benfica came 10 years after the Munich air disaster, which killed 23 people, including eight United players. "We travelled down by coach from Whitefield, in Manchester, on a glorious day," Molyneux said. "The journey took between six and seven hours but every service station we stopped at was filled with thousands of United supporters. People were hitch-hiking and getting lifts on milk lorries to get there. "There was no animosity between supporters then. Non-United fans were lining the streets to show their support and cheering the United coach. "When we got to the ground, I remember a big following of Maltese United supporters. The atmosphere was constant noise." Bobby Charlton's early second-half goal put United in front against the two-time champions, who were playing in their second final at Wembley in five years.But Jaime Graca, one of six players in the Benfica team to have played for Portugal in their World Cup semi-final defeat by England at the stadium two years earlier, equalised to take the game into extra time. "You could see Sir Matt trying to get the players going for the extra half-an-hour because they all looked exhausted," said Molyneux. Manchester United scored three goals in the first nine minutes of extra-time to take the game away from Benfica and become the first English winners of the competitionHowever, George Best scored early in extra time - the first of three United goals in seven minutes. "Once George scored, the floodgates were opened. I spent 20 minutes singing and celebrating. It was one of the best 20 minutes of my life," Molyneux told BBC Radio Manchester's Bill Rice. "I can remember a huge spotlight shining on the players as they went up to get the trophy and then paraded it around the pitch. "Some of the older guys had tears in their eyes and there was a feeling of having fulfilled a dream started by the Busby Babes in 1956." United travelled more than 14,000 miles as they played through four rounds to reach the 1968 final. There was a trip to face Maltese side Hibernians, another to Sarajevo, and a journey behind the Iron Curtain to face much-vaunted Polish champions Gornik Zabrze in a blizzard.Yet arguably the toughest trip abroad that season was also the shortest, against a Real Madrid side who had won the competition six times. Defending a slender one-goal lead from the first leg in Manchester, Busby's hopes of a first final at their fourth attempt hung by a thread. "A lot of the lads went to church on the morning of that match," said Paddy Crerand, a midfielder in that United side. "I think a few thought: 'We'll just go in any case to see if he can do anything for us.' Sometimes prayer can help. "It did not help that, four days before the second leg, they had missed out to Manchester City for the old First Division title - having lost two of their final three league games. "Losing the league was a heartbreaker," said Crerand. "We went and played at Tottenham in February and we were 1/6 to win the league but we blew it. "Pulverised during the first half at the Bernabeu, United trailed 3-1 on the night, and 3-2 on aggregate - although an outrageous own goal by Madrid midfielder Ignacio Zoco had given them hope. David Sadler, who drew United level on aggregate against Real Madrid, earned four England caps during his careerYet with hopes of the final slipping away, United manager Busby and his assistant Jimmy Murphy gave an inspirational team talk - as memories of the club's tragic European history drove the players on. "You could feel it [Munich] at times, particularly at half-time in the semi-final when we were 3-1 down," said Crerand. "The way that Matt spoke to us in the dressing room and Jimmy Murphy, who was so fervent - he was like somebody who had got in from off the Stretford End and been put in the dressing room. "Matt wasn't very happy about our performance or the way we had played and he just said: 'If we get the next goal, we're going to win. '"Don't forget you're playing Real Madrid in Madrid in the semi-final of the European Cup and you're 3-1 down. How many teams can get a result after that[/IMG]Crerand's free-kick laid the platform for Sadler to score and level the tie on aggregate.Then the wizardry of Best prevailed, with the Northern Ireland winger laying on the decisive goal for Bill Foulkes, the 36-year-old defender who had been a survivor of Munich. "Out of nowhere and totally not commissioned, Bill Foulkes turns up and slots one in like he's Jimmy Greaves," said Sadler.Overcome with emotion, Charlton lay flat out on the pitch at the end as United celebrated. "There were different groups within the team," Sadler said. "The older group, like Bobby and Bill, were closer to the boss and people saw it in different ways. "Someone like Bill must have been thinking: 'This is going to be the last chance I'm ever going to have at this.'" As United attempted to relax before the final, their preparation involved watching the Epsom Derby - won by Sir Ivor, ridden by Lester Piggott - on screens erected by the BBC for a special edition of Grandstand, hosted by David Coleman from the gardens of their Surrey hotel.Benfica's approach was equally modest, conducting their final training sessions at the Harlow Sports Centre in Essex, a five-minute walk from their accommodation. "I remember the waiting and anticipation," said former Benfica and Portugal winger Antonio Simoes. "We came three or four days before the game because, unlike today, we did not have a private aeroplane or special seats or anything like that. You had to take food with you when you played away from home. "Unlike the modern-day game - where players meticulously undertake a series of drills and stretches 30 minutes before kick-off to warm-up core muscle groups - the 1960s approach was also rather more basic, with players limited to conducting their own routines in the dressing room. Simoes said: "Today you warm-up, discuss tactics and can go out on the pitch to familiarise yourself with your surroundings. Back then there wasn't a warm-up. We had to sit down and we had a ball we played with a little bit. killing time." "Michael Jordan was the same in the NBA. Everyone knew what he was going to do with a basketball and he was able to do it for years. "When they are on fire people like Best, Messi and Jordan have the kind of talent you can't stop it."